. . . Firing Range0.9 km.
. . . Firing Range0.6 km. Hermelin — German Tier I cruiser. A large armored gunboat capable of operating on the high seas, intended for colonial service. Besides her powerful armament, Hermelin was also noted for her high speed, uncommon for this ship type. Captains' time in the ships of the Kaiserliche Marine and Kriegsmarine begins here with Tier I's Hermelin. Already on display is the German mindset for building cruisers: accurate, fast-firing guns capable of laying down withering barrages of fire any enemy ship they set their sights on. Hermelin’s guns are 128mm, which are actually larger then the guns on the next few ships in the cruiser branch (until Tier IV's Karlsruhe). The main draw back of Hermelin is that its large box silhouette gives it the highest detectability of any Tier I ship. She is essentially a floating citadel with guns; even incoming high explosive rounds have a good chance to rack up full penetration damage against her, let alone armor piercing shells. While her anti-aircraft is bar none the best of any Tier I ship, she will have to go way out of her way to even attempt to get paired against an aircraft carrier (which aren't available until Tier IV). Even if she could find her way into such a battle, with her speed and how easily she takes damage, aircraft would be the least of her worries. Highest firing range of all Tier I ships. Lowest reload time of all Tier I ships. Highest damage per minute of all Tier I ships. Accurate fairly damaging 128mm guns. Best AA out of any Tier I ship. Fewest hit points of all Tier I ships. Lowest chance of causing a fire of all Tier I ships. Highest detectability range of all Tier I ships. Somewhat sluggish and slow to turn (largest turning circle radius of all Tier I ships). Floating citadel that even HE shells can get often enough. Has AA that it will never, ever use. Hull: There is no hull module upgrade, but access to the the next ship in the German cruiser branch (Dresden) stems from here. Gun Fire Control System: Upgrade to FKS Typ 1 Mod. 2 for an extra 10% range on the main battery. Key skills for Hermelin commanders include Preventative Maintenance, Last Stand, Basic Firing Training, and Advanced Firing Training. For as many games as captains are likely to play Hermelin, the only real flag recommendation is Equal Speed Charlie London ( ) in order to move through the ship more quickly. Hermelin (Ermine) is based off of the Kolonialkanonenboot (Colonial Gunboat) Type K which was an attempt by German designers to create a class of gunboat suitable for use in naval bases and colonial holdings. Designed from 1938-39, a series of 8 ships were planned to be constructed before the entire project was cancelled, likely due to the beginning of the Second World War. 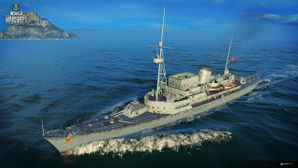 The Type K was given the name "Hermelin" by Wargaming in accordance with the German tradition to name small combat ships after small predatory animals. She shares this name with the S73 Hermelin, the third Gepard-class fast attack craft built by the German navy in 1983 and decommissioned in 2016. Note: The torpedo launchers present in the original plans were deleted by Wargaming in the name of game balance. This page was last modified on 15 November 2018, at 21:04.